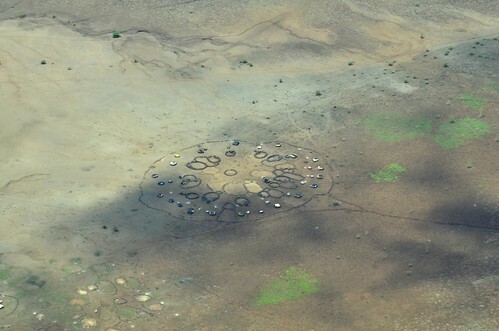 A human settlement in northern Kenya, from the air (photo on Flickr by Neil Palmer [CIAT]). A fact-filled, thought-provoking and myth-busting book, which many researchers will have reason to hope will become widely influential, challenges the African ‘drylands myths’ that, despite decades of research that should have overturned them by now, remain entrenched in many general publics and policymaking circles. The book, Dryland Opportunities, was written by Michael Mortimore and published in 2009 by IUCN. Drylands, such as those in the drought-afflicted Horn of Africa, where famine continues to claim lives and livelihoods, cover 41 per cent of the earth’s terrestrial surface. Scientists are predicting that life in many of the world’s drylands may become even harsher in future due to more extreme and unpredictable climates. This book aims to apply the new scientific insights on complex dryland systems to practical options for development. A new dryland paradigm is built on the resources and capacities of dryland peoples, on new and emergent economic opportunities, on inward investment, and on the best support that dryland science can offer. Primary author Michael Mortimore, now 74 and a consultant for aid agencies, is a British geographer and researcher on Africa’s drylands who spent over 25 years in Nigerian universities and is best known for his field-based studies of adaptation to drought and for an anti-Malthusian account of population-environment relationships, More People, Less Erosion, which is a revisionist account of livelihoods in Machakos, Kenya, written with Mary Tiffen and Francis Gichuki (1994). He and Tiffen now run a policy consultancy called Dryland Research. Mortimore has conducted extensive studies of farming systems, environmental change and human adaptation to drought in the drylands of northern Nigeria, Kenya, Niger and Senegal and assessed local and regional human adaptations to harsh and complex environments. Among his long-held views on African drylands are that even the most disadvantaged African smallholders ‘adapt’ more or less successfully to climatic change and severe drought, rather than submitting to it. He has been a long-term critic of the argument that the Sahara is ‘spreading’ as a result of poor land management, or that farmers and herders tend towards destroying their natural capital. He challenged the well-funded international desertification apparatus to listen to farmers who, with the right support, were improving biodiversity and halting land degradation without expensive and inappropriate interventions. From 1991, in the Machakos Hills of Kenya, less than an hour’s drive from Nairobi, Mortimer, Tiffen and Gichuki discovered not the land degradation and human impoverishment widely believed at the time to have occurred there under high population pressure, but rather improved landscapes and resource management practices achieved through adoption of farming methods such as multicropping, mixed crop-livestock production and land terracing, as well as through strong community organizations. This much-cited finding, published in 1993, ‘controverted’ Malthusian thinking and has echoed through revisionist thinking about African degradation myths and agrarian policy ever since. A PDF of the book is available on the IUCN website: Dryland Opportunities. Source: This profile of Michael Mortimore is taken and condensed from Wikipedia. Tags: IUCN, Michael Mortimore. Bookmark the permalink. Previous post ← Are politicians making political hay – and pastoral havoc – out of diminishing dryland resources in northern Kenya?